Sofa Saga, Part 3: Interview with Flame Retardants Expert, Heather Stapleton | Laura's "Rules"
By almost any measure, Duke University Environmental Chemistry professor Heather Stapleton is, well, a bit of a Superhero. Her Super-powers include: not taking the words “it’s proprietary” too seriously; using x-ray vision to pierce through the truth of greenwashing labels (an ability amply demonstrated below); and caring far more about the safety and health of your children than the chemical companies (ok, maybe that last one sets a very low bar). She was shocked at the results. Levels of flame retardants were much higher than she had expected….“When we presented this, it really opened people’s eyes. It made sense. It all fell into place. It was a different paradign about how we think about the sources of, and exposure to, these compounds.” It turns out that PBDEs leach out of the products they are put into: the squishy foam in a sofa, the padding in a mattress and the back of a TV set. 1) Why did you start researching flame retardants in furniture? I’ve been researching flame retardants since graduate school. As a graduate student, I was interested in how the chemicals were accumulating in wildlife and how they were metabolized, but then my interests moved more towards understanding human exposure and health effects. This naturally led me into analyzing consumer products to better understand which chemicals were being used as flame retardants in products and to collect information on the levels used in these products. 2) What has your research found about the prevalence of flame retardants? What are they doing in baby strollers? Some flame retardants are now considered ubiquitous. They are present everywhere, from the dust in our living rooms and bedrooms to the air in the North Pole. They are unfortunately applied to numerous baby products, including strollers, because these products contain polyurethane foam, and some agencies consider these products to be “juvenile furniture.” According to a California state law, juvenile furniture has to meet a flammability standard. And the only way to meet this standard in a product containing foam, is to add these types of chemical flame retardants. This is a difficult question to ask. We know much more about PBDEs than we do FM 550 or TDCPP (the primary Tris…there are actually many different types of Tris…so use caution in using this term). And FireMaster 550 contains chemicals that may also be neurotoxicants and endocrine disruptors…we’re trying to evaluate this now. We just don’t know much at all about FM 550, yet we know that people, are particularly children, are receiving chronic exposure to FM 550 in their homes through contact with indoor dust particles (the same pathway as PBDEs). 4) What should consumers do to minimize exposure to these chemicals? Support legislative efforts to prohibit use of these chemicals in products, particularly baby products. There is actually no proof at all that these chemicals reduce the fire hazards of furniture (NONE- zippo!). There is a lot of mis-information spread by the chemical industry on this point. Most people assume that these chemicals prevent products from catching on fire, but they do not. But to reduce exposure, the only suggestion we can offer is to avoid buying products that contain foam (and are more likely to contain flame retardants), and wash your hands often. Our recent studies demonstrate that people are more likely to have higher exposure and body burdens if they wash their hands less frequently. Washing hands is always a good practice for all health concerns! 5) What do you do in your home to minimize exposure? It’s very hard to minimize exposure. The furniture in my house is manufactured in Italy by a manufacturer who does not make furniture to meet the California flammability standard. While it’s great, it’s also much more expensive that most furniture solid in the US. And for most of our baby products I was able to find flame retardant free products by searching for products that do not contain polyurethane foam. Most products that contain polyester filling do not need flame retardant chemicals to meet the California standard. 6) Is it possible to avoid flame retardant chemicals in older furniture? Is there a date before which they may safer? Flame retardants have been in use in different applications and products for several decades, at least as early as the 1970s, and maybe earlier. No, there is no way to know if older furniture contains flame retardants, but it’s very likely that it will have flame retardants if the furniture contains polyurethane foam AND contains a label indicating that it meets the flammability requirements of CA TB 117. 7) One small furniture maker, Eco-Select Furniture, in NC, sent me their foam label. I would very interested in your view on what is likely to be the chemical used. The label you sent is simply an advertisement for the Certipur program. This is a program developed by US polyurethane foam manufacturers to demonstrate environmental stewardship. It means that the foam used in that product has been tested for several known toxins including VOCs, metals and a few flame retardants. But the product can certainly still contain a flame retardant and have the Certipur label. There are many in use on the market today that are not tested in the Certipur program and for which we have concerns about health effects (e.g., Firemaster 550, V6, triarylphosphates, etc.). 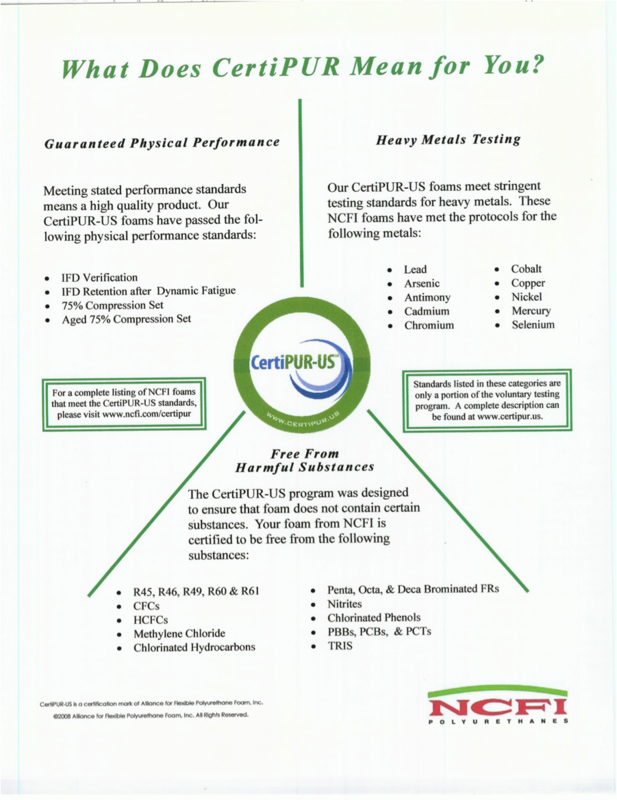 If the product has a Certipur Label AND a label indicating that it meets CA TB 117, it still has a flame retardant in it, then that Certipur label only means that it does not have PBDEs (which were phased out in 2005 anyway) or Chlorinated Tris. 8) What is the impediment to fixing the California law so that these chemicals are only in products as needed? Yeah, that is the million dollar question. Unfortunately, I think any attempt to change the CA law is going to be hampered by the chemical companies lobbyists who spread misinformation and use scare tactics to impede the truth and prevent any legislation from passing. This entry was posted in Environmental Health & Safety and tagged babies, baby, California, chemicals, Death by Rubber Duck, environmental health, Firemaster, flame retardants, furniture, green, health, infancy, mommy blog, parenting, PBDEs, safety, sofa, Stapleton, television, Toxic, toxic chemicals, toxics, Tri by Laura MacCleery. Bookmark the permalink. Considering the most recent law changes after January 2015, a lot of new furniture says, “no added flame retardants”. Is there still a possibility of flame retardents in the foam? Or is it completely rid of flame retardents? I’ve been looking for a new couch and can’t decide between completely chemical free couch or one without flame retardents? I live in California and I just found out that Pottery Barn, Crate and Barrel, West Elm and Room and Board are committed to not using flame retardants. Now it is a law in CA but I think these companies will ship their pieces to other states and still be committed to no flame retardants. I am going to get a Rowe sofa, however, because I like the styles better, they are well made, and the prices are a little lower than the above mentioned brands. Hi Laura I just discovered your blog. I have severe chemical & fragrance allergies. I need new mattresses, new furniture, flooring and a kitchen remodel. Have not done any of this for over 20 years due to SEVERE allergies. I see the rec for sofas, which are so expensive I have not been able to buy one.😒 Any advice for carpet, tile, or wood flooring? How about kitchen cabinets, countertops? I am so desperate. My 25 yr plus furniture needs replacing as does my mattresses, flooring & kitchen. Can you help or advise me where to look? I did finally figure out what question I was asking incorrectly about the flame-retardants. It was not just “are you using flame retardants?” but “what chemicals are you using?” When that information came out I found that the non flame retardant furniture is just a niche market. The use of polyfoam will still cause off gassing of carcinogenic chemicals and toxins into your home, including benzene and toluene. If the company uses polyurethane foam there is NO getting around these chemicals. Thus EcoBonanza and Ekla, which use latex, do not have these chemicals. There are some other futon style wool furniture companies that are cheaper, but don’t have the same style. Its really just a futon in your living room, which was ok in college. So make sure you dig a little deeper, if you are going to pay 5k for poly foam why not pay 6k for NO chemicals. That’s my thought. I’m going with the Ekla sectional that is about 8500 in wool. The similar product from EcoFurn or Conodo Furn is still close to 7k. Only, I’m not fooled that I have a better air quality. Did you get that sofa, what did you think? So has any of the answers changed? I’ve looked into Elka and I just can’t justify the carbon emissions to get a sofa from CA to NC PLUS have it cost $5000. Its just crazy. The other options on the East coast, Endicott and EcoSelect Furniture, frankly, I don’t like their answers. Both have poly foam. Endicot: All warranties on the cushions are voided under Condo Furn bc I don’t live in ME. They take 6 weeks to build, cost almost 3k, and their customer service is so-so. They say no flame retardants but what else does polyurethane foam off-gas? I don’t have a good answer for that, and they seem to skate the question. EcoSelect: Its a couple hundred cheaper, but takes 2 months to get it. Are they growing the soy-based foam from seeds? Endicott says the soy is just a cheap filler when petroleum prices are high. The rest is polyurethane foam without flame retardants, or so they say. But all these companies seem to be playing a little fast and loose with the truth. And once I sink 2k into a sofa, send a foam sample to Duke, and then find out its got no flame retardants but is full of petrol-chemicals, did I really improve the air quality in my house? I’m not convinced these guys are actually telling the truth bc their answers never change, they just read off a list. They seem incapable of answering the questions actually posed, and just try to steer me back to their advertising mantra “zero-flame retardants.” Any other question, or one more in depth, and I get crickets. The environmental working group just published a list of couches without flame retardants and they are from the likes of Ikea, PB and Crate and Barrel. Thank you for all your research! My husband and I are in the market for a sofa and loveseat. I like a traditional look – not the modern stuff that sometimes comes with the “green” label. On another blog someone mentioned Lee Industries. I found them online… and they say they don’t use flame retardants, etc… They do use some polyester fabrics, and some petroleum based foam in addition to soy. Pretty pricey too – but they have (in my opinion) some beautiful and apparently well made designs. Have you heard of them? Your thoughts? Anecdotal at best but Ashley Furniture CEO has a daughter with a heart condition. Similar heart conditions have been linked to the flame retardants in question. Might be a correlation/causation issue but I find this to be curious. At Endicott Home Furnishings in Maine, we designed an entire line of nontoxic sofas and chairs. All our designs, including sectionals and sleepers, are bench crafted one at a time in the USA using materials containing zero flame retardants. Because we often customize to help elders stand without help, or to provide lumbar support with both feet on the floor for our petite consumers, we use frames made of sustainably harvested hardwoods combined with furniture grade nontoxic plywood (no added urea formaldehyde or toluene or other nasty chemicals) and many other materials made partly or completely of recycled materials. We completed our removal of carcinogenic flame retardants from all our designs before anyone was concerned, and in the middle of a recession, so we did so at our own cost, because we are our own customers, and have two small children. Our designs are very reasonably priced with a limited selection of USA-made OEKO-TEX Standard 100 certified nontoxic fabrics, and we ship to all lower 48 states including California. Feel free to reach us for more info@condofurniture.com. Buyer beware. The only thing that has changed in California is the warning label and the requirement that fire retardants must be used. They are now optional. As of January 1, 2015 in California, fire retardants must be disclosed to the consumer, but they may still be used. It is up to the manufacturer. Your blog has been incredibly effort in our current search for a chemical-free sofa. My question: how much of the toxicity is from petrochemical-derived foam vs. the flame retardants? From reading all your entries, it sounds like the main, and perhaps only, culprit is the flame retardants. If I were able to procure a sofa with standard foam (say, the EcoSelect option with 25% soy foam / 75% standard petrochemical foam and no flame retardants) without flame retardants, would this be considered healthy? I realize non-petrochemical options, like latex, wool, and down, are better from an environmental impact point of view, but in terms of purely the impact on health, are flame retardants the only thing I should be worried about? We just bought a leather EcoSelect sofa (ordered by phone) because we wanted to avoid the flame retardants and have been happy with it so far. But if because of sensitivities you want to minimize all potentially toxic chemicals, you might try Furnature in Watertown, Mass. I visited the store and liked it, but the sofas cost a few more thousand dollars. So, where are we at, at this point in time? Petrochemicals being used without flame retardants are okay for health? Certipur is just another way in and around by using fancy jargon? Soy foam? What is that really? Another item that is a “pure sounding” title, but isn’t really? I STILL need a sofa, and I STILL cannot afford most of the well known natural latex ones, which all seem to be in California and to ship to NC, well, there we go adding on even more cost to the unaffordable beginning. Even with the “law” change, is anything really changing? Ecoselect using standard foam, just doesn’t seem good enough to me. Sold my old couch, moving next week, big family with NO where to sit! Help! I have been looking for a safe sofa and I just saw that Ethan Allen now uses Certi Pur foam in their mattresses and furniture. Unfortunately, I’m having a hard time finding out if they still contain toxic chemicals/flame retardants.. The sales rep just said that they meet the certified standards. So frustrating. Any thoughts? My husband wants to sit in the sofa before we buy a new one. I am a mom with 3 kids and have had thyroid cancer, which I’m sure is from all this toxic stuff i’m unfortunately putting into my home. So my mission is to be as green as possible while not breaking the bank. Thank you so much for all your research you have done/doing. My friends think I’m crazy but after reading this blog I believe I fit right in! I live in Michigan. Not many options other than Ethan Allen, Pottery Barn, Crate &Barrel ect. Wish there was more around here. Any information would be greatly appreciated. I ordered a sofa from Ekla Home for around 3 thousand dollars a couple years ago. It’s very good quality, it has latex cushions and hemp upholstery. I compared prices for this type of furniture and Ekla Home, while not cheap, was acceptable – other online companies had similar sofas for twice the price, and a lot of so-called green furniture is more greenwashed than truly green. Ekla Home turned out to be the real deal. The owner answered all my questions (and I had a lot of them!). I live in Wisconsin and the company is in California, so I didn’t actually see the sofa until it was delivered. I am very happy with it. I expect it to be my last sofa ever – after 2 years it looks like new. Delivery charges were 350 dollars. All in all, I’m not sorry that I bought it. I’m not rich, so it was rather expensive for me, but I don’t have to worry that a sofa will make us sick, and my daughter, who is 11 now, has always been very healthy – undoubtedly, not just because of the sofa, but that’s just another little thing that we did right, and I’m sure glad we did. You can always make more money, but it’s hard to buy your health back. Thanks so much for this feedback. I’m a little concerned about Ekla, as another customer contacted me via email and said his Ekla Home sofa has an odor similar to other couches he has returned, and that he requested some certifications from them concerning their materials, and has not yet received the papers. I then wrote them directly asking for this same information (about three weeks ago) and never got a response. Instead, I’ve had two comments in that time from folks supporting them. While I’m not AT ALL saying your comments are not genuine or candid, I’m wondering if the company asked you to submit your opinion? If so, I’d like to get back in touch with them and find out what’s up about this other customer. My sofa didn’t smell, but it spent a long time in transit. The delivery company messed up a bit (I’m being generous here!) and my sofa went from California to North Carolina, then back all over the Midwest and God knows where else. It was finally delivered to Wisconsin where I live, but it took about six weeks. If there was any smell, it was rather faint and went away quickly. It was summer and I had my windows open all the time anyway. Having said that, I ordered a couple latex mattresses from Lifekind several years ago. I think I ordered them a year or two apart. The first one didn’t smell at all, the second one did smell a little for a couple weeks or so. I forget what exactly they told me, but they said that it’s definitely not some harmful chemical off-gassing and not to worry about it. Ekla Home did not ask me to submit my opinion. The owner, Emily Kroll sent me an email asking how I liked the sofa (that was before the sofa was even delivered – she didn’t know there was a delay), but that’s all. I came across your blog by accident. I want to reupholster an old ottoman. I plan to do it myself and I was looking for some ideas what to use for the cushion. After I wrote my first post I looked at your blog some more and I must say it’s remarkable what you’ve done. I wish i had read it all before I started looking for my sofa – it would have saved me a lot of time. I too did quite a bit of research before I ordered the sofa. It was quite an investment and I didn’t want to spend a lot of money and end up with something greenwashed. I did not ask Ekla Home for any certificates. I looked at their website. They had some links to a few articles in various press outlets at the time with interviews with the owner. I read them, they impressed me and I decided to contact the company and asked them if they could make a certain sofa that they had a picture of on their website – it wasn’t even one of their regular offer – it was only described as “custom 19” . I asked for the details, the price, dimensions, what’s in it, etc. My impression was that the owner really believes in what she is doing and she’s not in it for a quick buck, and my subsequent experience confirmed it. She explained exactly what materials are going to be in the sofa, sent me swatches of fabric (free of charge), explained my options and was very generous with her time answering all my questions (mostly via email). My emails were at first returned promptly. Later, after I already sent them the check and it seemed like it was taking a long time for that sofa to be made (I think it took about six weeks) I remember having to wait a few days for an update, which got me a little worried (hmm – I sent a big check to some “company” I found on the internet . . . They said they were in California, but what if it is, after all, Nigeria . . . 😉 Anyway, it turned out that Emily has an elderly mother in London, England and seems to visit her frequently. She said she still works when she’s there, but it might be a little harder to answer messages this way. Whatever. It all ended well, even if at first it didn’t look like it would. – When the sofa finally arrived, it turned out that they upholstered it with a wrong fabric and a protective throw we also ordered wasn’t there – it was lost by the delivery company. The owner was genuinely very distressed – first about the delay, then the rest. It turned out that somebody who was a temporary help mislabeled the fabric swatch they sent us – they couldn’t even find that fabric and didn’t know what it was. To cut a long story short – the owner offered to either take the sofa back and replace the fabric – which would actually mean making a new sofa for us – she said they would sell the one we got at a discount as a floor sample, or she said she could send us slipcovers for the sofa, which is what finally happened. All that at her expense and she was very apologetic and not at all confrontational – she said nothing like that had ever happened before, etc. Oh, and she refunded what we paid for the lost throw. So there. I took my time to write this, but first of all I think that Ekla Home is a fantastic company. The owner really went the extra mile to solve the problems that were not quite of her making – she even tried (unsuccessfully) to get us the refund for the (significantly delayed) delivery. I think that’s important. Second of all, I know from experience how hard it is to do all this research, and if you are going to spend a lot of money it’s nice to know that you’ll get something that is good quality and it is what it claims to be and not some greenwashed junk that you can get anywhere for a fraction of the cost. You are doing some great work here Laura. I’ very impressed. Thank you Laura. I looked at my first post and it does look like it could have been written by the company rep. (I wish – it seems like a good place to work.) But I really want people to know that it is a good company. The sofas you can see on their website are beautiful and so is the one I got. It is very well made too, and I am convinced they do use healthy materials, though I agree they should be able to provide some documentation confirming that if requested. As you can see from my post there were some things that went wrong with my order and it could have been a nightmare. It wasn’t. The problems got solved, nobody went ballistic. The owner could have made it difficult for me, she could have tried stalling, she could have denied responsibility, she could have done all kinds of things. I had already paid in full and the sofa was in my house. Instead, she admitted that they had messed up and offered to do anything to solve the problem – including a completely new sofa. I don’t know how anyone could beat that. She said she just wanted her customers to be happy. It’s odd that they wouldn’t respond to requests for certifications. It’s possible they are busy, it’s possible they have more business they can handle. I really have no idea. All I can say that, in my experience, it’s a great company. I realize you should take ALL these reviews – both positive and negative – with a grain of salt . Based on my experience, I would encourage anyone looking for a healthy sofa to buy it at Ekla. Are there some other good companies selling non-toxic furniture? Probably. Would I buy something very expensive based on a basically anonymous review I read on a blog? Certainly not. But it would encourage me to take a closer look. Ultimately, everyone needs to do their own research and rely on sources they can trust. And no matter what, it’s always a risk. All you can do is minimize it by doing your homework. Good luck everyone looking for a healthy couch. I know it’s confusing, time consuming and frustrating. I’m glad I’m done. Thanks again Laura for doing all this research. I’m sure it will help a lot of people. PS I apologize if this is in a wrong spot, but there doesn’t seem to be an option to reply to your last post. I would ask Ken directly for a few references to see if he has them — or folks, please chime in! I know I have personally spoken with several satisfied customers. I am an interior designer, and would suggest the following. Sit in a bunch of sofas at a showroom that you have access to. The primary criteria that affect comfort are the depth of the seat, the Ht. of the seat (usually 18″), the arm height, the construction of the back, and the stuffing. Measure the first three on a sofa you find comfortable. The depth of the seat varies greatly from 20″ to 28″, and the deeper seats tend to have a slouchier feeling. I tend to do deeper seats in family rooms, and shallow-er in living rooms, where you are more likely to sit a bit more upright. Once you know the seat depth, seat ht, and arm ht that feels good to you, check in with Eco-select to find a frame that is the same dimensions. Second, loose back sofas tend to be comfier to nestle into than tight back ones, where the back cushioning is on the frame, rather than in a separate cushion. However they are deeper, so it depends both how deep of a sofa will fit in your home. The softest sofas have down back cushions, which mold to your body and feel great, but have to be fluffed so they do not look squished. I think it is worth it, but you need to know your self, and whether you can live with this. I do not believe that you can feel the difference between latex and petroleum based foam. You should pick your sofa based on measurements, back style, and pillow type. If you have sat in a 25″ deep sofa, with an 18″ seat ht., and 26″ arm, with separate dacron wrapped foam back cushions, and you found the comfort and fit perfect, then you can order a sofa with those details, without ever sitting on it, and be pretty darn confident that you will find it comfortable. And if you get a sofa without flame retardants, you have the added comfort of limiting your chemical exposure. Yes, thank you! We’ve ordered the sofa. Your blog is so awesome! Thank you. I am curious about these claims…would this company pass the test for you and Heather? I’ll also send her a link. Let’s hope we can move away from flammability standards requiring these chemicals in foam in the first place…..
She is so great at parsing the B.S. — but I wonder how many people have been utterly misinformed by the misleading use of the word “organic” — such intentional greenwashing is so upsetting. Thanks for keeping up apprised! you or Dr. Stapleton say that PBDE’s were phased out in 2005. Is that right? No more PBDE in furniture cushions manufactured after 2005? Thanks for the question, but unfortunately we don’t have any such reassurance. There are bans on several forms of pbdes, but a third remains largely unregulated. Companies did generally use less pbdes because some savvy consumers started asking about it, but there’s no legal rule, and who’s to say that the substitutes are any better. What is the Italian furniture label? Thanks! I was wondering if you live in a state outside of california if you would run into an issue with flame retatdents in sofas, I have called and called and 98% of the manufactures simply don’t know any they have and one says no but ow do I believe when I have another co. Telling me it is required in all sofas even in my state notin calif. and the other one says o we don’t but the local dealer says yes so I get so many conflicting stories. I’m looking at the everyday brands. I’m wondering if buying leather would encase the fire retardants or would the leather pose a problem?